When winter arrives, I think the snow is so pretty and making a fire, having a scotch, snuggling under blankets is perfect cozy comfort. When winter just won’t quit after five months, cozy becomes claustrophobic and all that comfort just becomes sad slothfulness. I sink into the depths of despair. When this happens, I look to Anne Shirley’s wholesome optimism to buoy my spirit. And I ignore Marilla Cuthbert’s fire and brimstone quip that “to despair is to turn my back on God.” Sometimes Marilla just doesn’t understand. Anne-girl reminds me how gorgeous spring looks, feels and smells: orchards bedecked with boughs and boughs of wee pink and white flowers, babbling clear and cool brooks, flowers fragrant enough to drink in their scents, undulating grassy fields that roll to the sandy shore, warm breezes, and lush woodlands dotted with ferns. Anne rhapsodies better than I do but you get the picture. Side note: I love you Gilbert. This winter seemed to have been worse than anything I remember in the past. 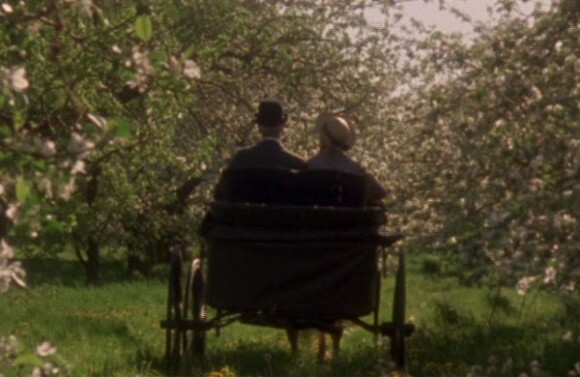 I read all of the L. M. Montgomery’s Anne books this winter (except for Anne of Windy Poplars because it’s boring) and watched the whole mini series. It felt like a lifeline that pulled me out of the winter dregs. It helped me feel that spark of the old me – the one that loves to cook. Finally having the urge to cook again for the first time in months, I reached for a book from my favourite cookery writer, Nigel Slater. He’s a friend in the kitchen and I wouldn’t want to celebrate my return with anyone else. I plucked his latest, The Kitchen Diaries II (Fourth Estate, 2012), off the shelf and read through the recipes like a brand new, and starving, woman. 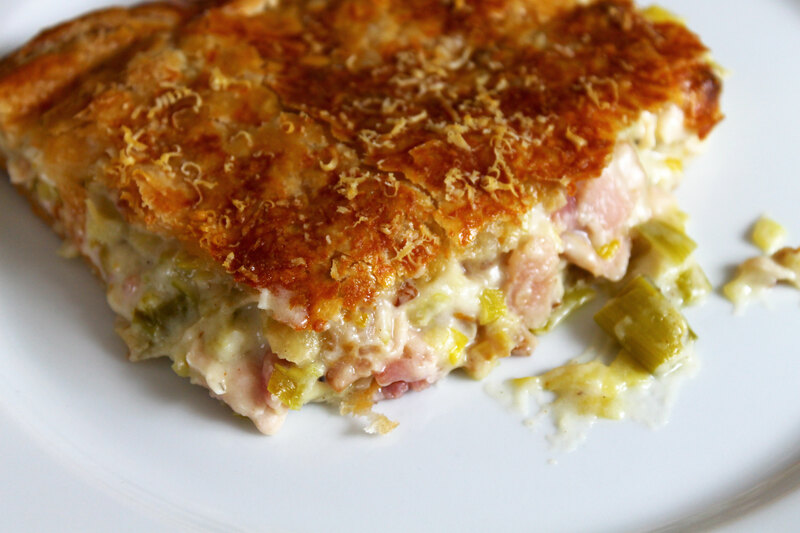 My eyes landed on a chicken and leek pie recipe with gentle and wholesome flavours. It’s a recipe that reads like it’s from a simple and homespun era; it looks like something Anne would make. But not in the first book, Anne of Green Gables, because she had no idea what she was doing in the kitchen – like when she baked a cake and forgot the flour. We have to wait until the second book, Anne of Avonlea, before Anne becomes quite the domestic doyenne under Marilla’s tutelage. The flavours in this recipe are old-fashioned and the cooking methods are simple and straightforward. You just need some patience and steadfastness to see you through the multiple steps. The chicken is poached in whole milk with simple aromatics straight from a kitchen garden – onions, bay, and thyme. 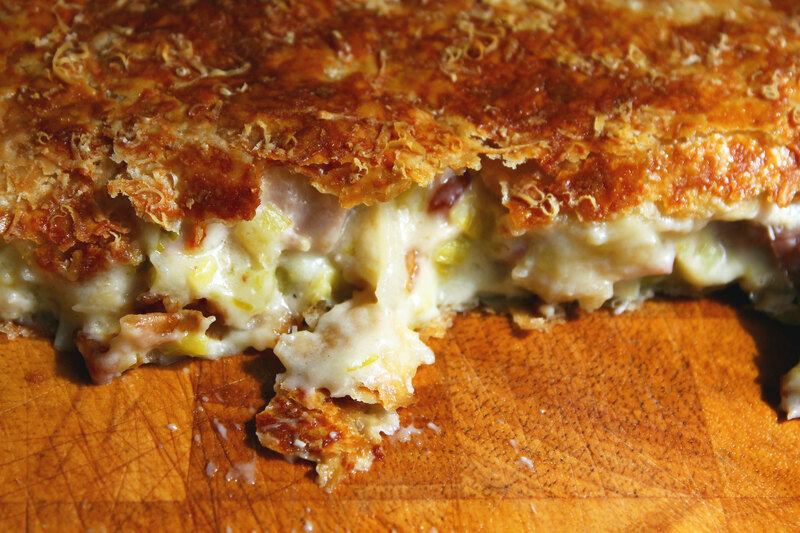 The chicken is then diced and folded into a creamy sauce with sautéed bacon and tender leeks and everything is then wrapped up in a flakey buttery pastry. Even using whole milk for the poaching seemed more Anne-like and well…wholesome. 2% or 1% wouldn’t have cut it in this recipe. As I’m cooking, I wonder if Nigel and Anne would have a good time in the kitchen together. I think they would. They both love the domesticity of the kitchen. Neither of them begrudges the time it takes to prepare a dish; there’s no rushing to get through a task. They both madly love to garden and they find the beautiful in the earthly everyday. Nigel seems kind of quiet, though. And Anne sure does like to talk. I’m not sure if he’s the quiet type, like Matthew Cuthbert, that likes it when someone shares every thought. If he’s not, Anne might drive him bonkers. I’m just going to believe that they would be fast friends. Who would have known there was so much scope for the imagination in a pie recipe? My only addition to the original recipe is that I added some thyme sprigs to the poaching liquid. Put the chicken pieces into a large saucepan, together with the half onion, peppercorns and herbs and pour enough milk just to cover the chicken. Bring to the boil, then, just when it starts to bubble, lower the heat and leave to simmer, partially covered by a lid for about twenty minutes. Remove the chicken from the poaching liquid, reserving the milk. The poaching milk will smell savory and rich. Once the chicken isn’t too hot, pull off the skin and cut the meat off the bone into small, plump pieces. 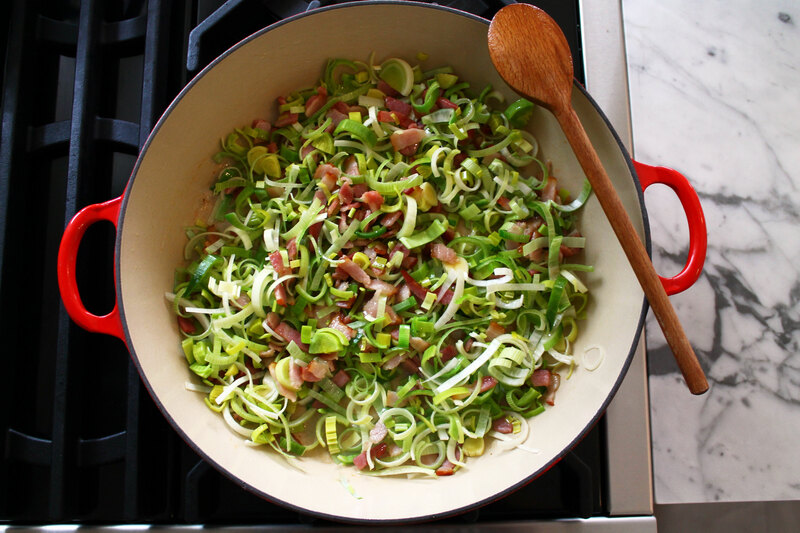 Slice the bacon into small pieces and the leeks into thin half moons. 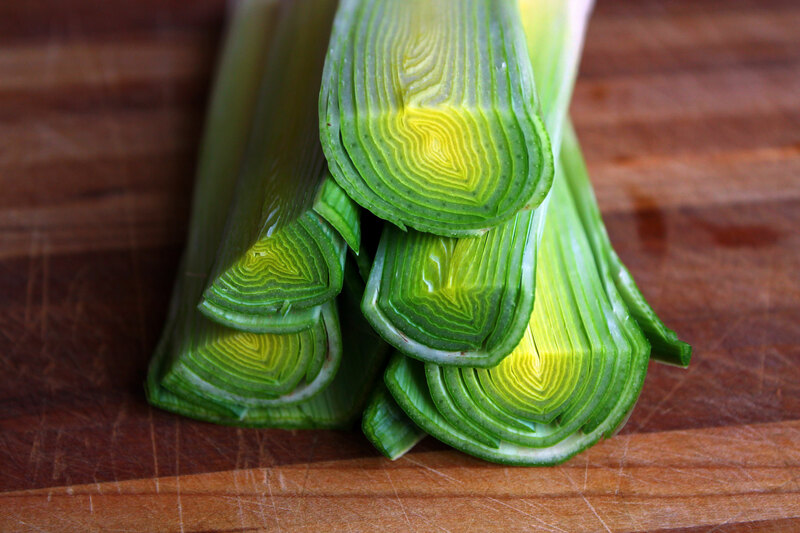 Oh and make sure you wash those leeks really well so there’s no grit between layers. Melt the butter in a large saucepan and add the bacon. The bacon should soften without colouring over a moderate to low heat. Add the leeks to the bacon and continue cooking for about fifteen minutes more, until the leeks are totally soft. Stir the flour into the leek and bacon, continue cooking for a couple of minutes. Gradually strain in enough of the warm milk to make a thick sauce. You don’t want this to be a paste, you want it to be a sauce, albeit a thick sauce. There should be enough ‘give’ in the sauce so that the chicken can be mixed in well and coated properly by the sauce. Season generously with salt and pepper and stir in the Dijon mustard. Unroll your first sheet of puff pastry onto a lightly floured surface. Roll it out to about 10.5 x 14.5 inches. You might need to put a little flour on your rolling pin to keep it from sticking. 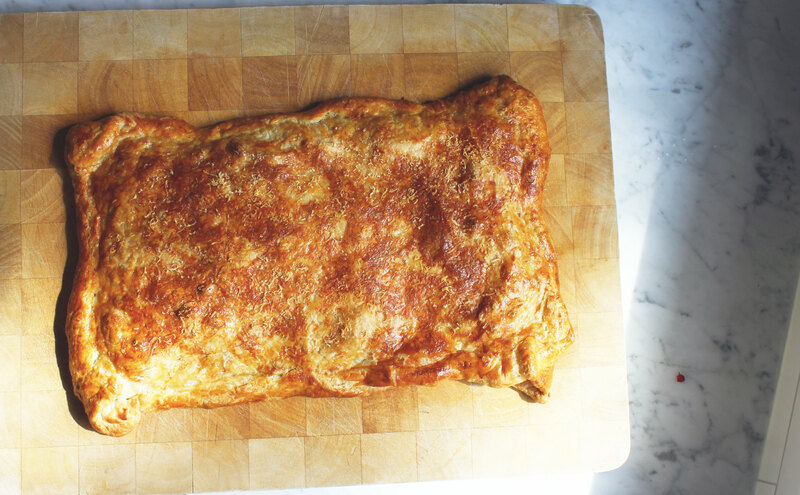 Place it on a baking sheet. Spoon the filling onto the pastry, leaving a wide rim all the way around. Brush the rim with the beaten egg and milk. Roll out the second piece of pastry to the same size as the one before and lower it over the filling. Press and crimp the edges together firmly to seal them. You don’t want the filling to leak so make sure the edges are sealed tightly. Brush the pastry all over with the beaten egg wash and scatter a handful of the grated Parmigiano Reggiano over the surface. Bake for thirty-five minutes or until golden. Lordy that thing looks beautiful and decadent! I was a little in withdrawal from your supreme blogging and am well satisfied! Must try this (also love Nigel) and did I mention I toured the Anne of Green Gables village in PEI last summer. Some mighty fine lemonade and fiddling happening.